Zico Albaiquni’s paintings are rich with diverse themes and genres from the history of Indonesian art, incorporating early influences from his father’s generation of artists, as well as referencing works that have featured in previous Asia Pacific Triennials and Venice Biennales. 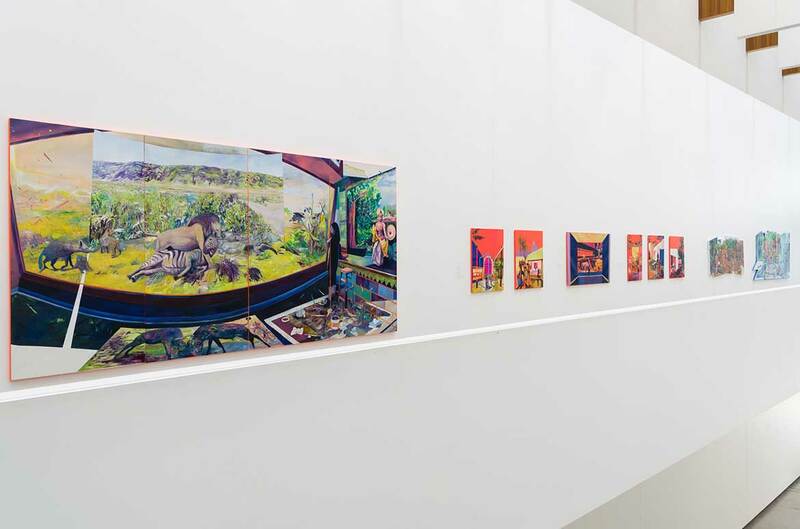 From the role of painters in traditional Sundanese contexts to the commodification of Indonesia as an exotic tourist destination, we explore some of the factors that have shaped and enriched the artist’s practice. Fear of being overshadowed by his father’s legacy initially led Albaiquni to pursue a career in graphic design. While Albaiquni was still a student, Sanjaya took him to an exhibition at the National Gallery of Indonesia, where he first encountered Perusing a Poster 1956 by Sindudarsono Sudjojono (1913–86), widely considered to be the father of Indonesian modernism. Albaiquni was astonished by the painting — the way Sudjojono had captured the image; how he had worked the pigments; how his realism emerged from abstract strokes over the canvas; and how he had composed the figures to look in the same direction, beyond the painting. Albaiquni comes from a Sundanese family, an ethnic group from the western part of the Indonesian island of Java. According to Albaiquni, the Sundanese believe that art, religion, spirituality and the environment are inseparable. A painter, in the Western sense, is often seen as a genius who creates artwork to inspire others — someone valued for their individuality. In Sundanese tradition, however, the pelukis (painter) is someone who connects society, spirits and the environment to create balance through their work; it is a much more community-oriented role. Albaiquni is intrigued by these two opposing traditions and considers how the pelukis, at every step of the artistic process, is guided by a set of rituals both physical and metaphysical, asking for a blessing from their community, the spirits and nature before starting a work, and repeating this ritual when the painting is finished. 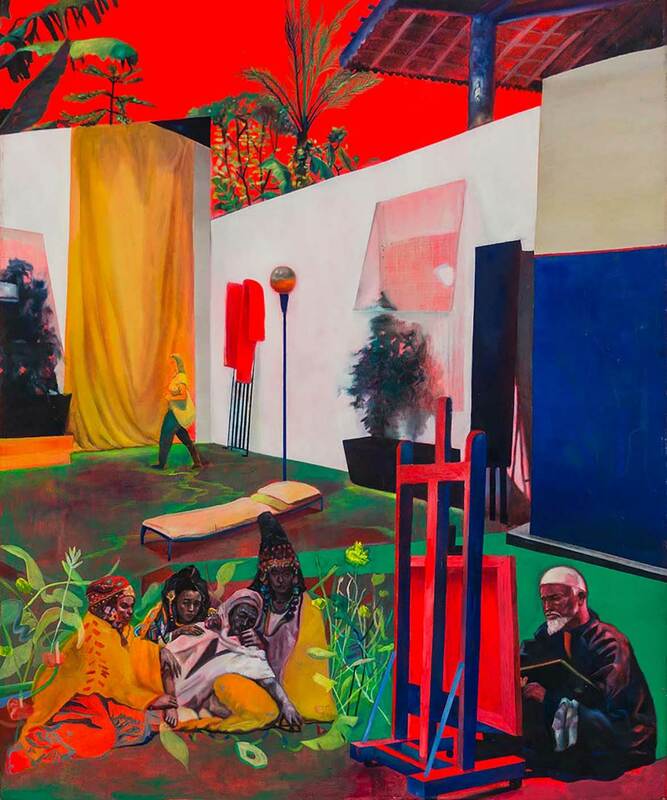 While his works often include thoughtprovoking juxtapositions and broader references to both Indonesian and international art traditions, Albaiquni has a particular interest in how the landscape of his country has been exoticised and commodified throughout history. Mooi Indie (‘beautiful Indies’) is one of the most recognisable styles of painting in Indonesian art history. Historically, Albaiquni says, Mooi Indie came from the colonial mindset that viewed Indonesia as an exotic destination for middle-class European tourists and business travellers. The genre sparked heated criticism among artists during the independence movement in the first half of the twentieth century, but it is nonetheless still popular throughout the country. Albaiquni’s own interest in Mooi Indie began with one of his father’s works: Sanjaya had inscribed ‘Neo Mooi Indie’ in his drawings in reference to the government-run tourism campaign ‘Visit Indonesia Years’, which promoted Indonesia to the world tourism industry in the final years of President Suharto’s rule, and in the first decade of the twenty-first century. ‘Indonesia was no longer being exoticised and commodified by foreign interests, but by the state itself,’ says Albaiquni. He began researching land development, economic investment, and the commodification of rural areas — which, in some cases, included sacred and religious land — and started using Mooi Indie as a pretext for his landscape paintings, borrowing the visual language of property advertising and real estate banners. His distinct palette also arises from pigment combinations drawn from the colonial painting genre. 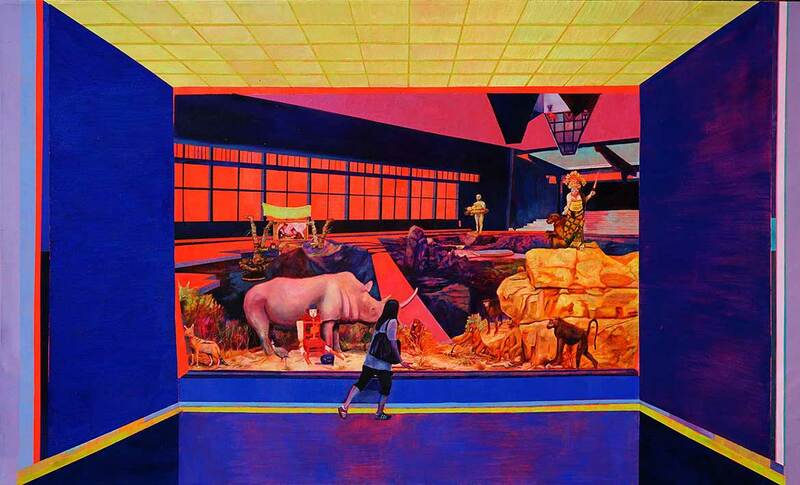 Albaiquni’s works borrow imagery from wide-ranging sources, including the acclaimed nineteenth-century Indonesian painter Raden Saleh (1811–80), museum dioramas, tourist art, signature works by contemporary Indonesian artists, and installation views from international exhibitions such as previous APTs and the Venice Biennale. By combining these seemingly disparate influences, Albaiquni grants himself the freedom to push his aesthetic ideas beyond the remnant postcolonial views and sociopolitical narration of Indonesian art, and he aims to compare global art discourse with what he regards as politically heavy Indonesian contemporary art. 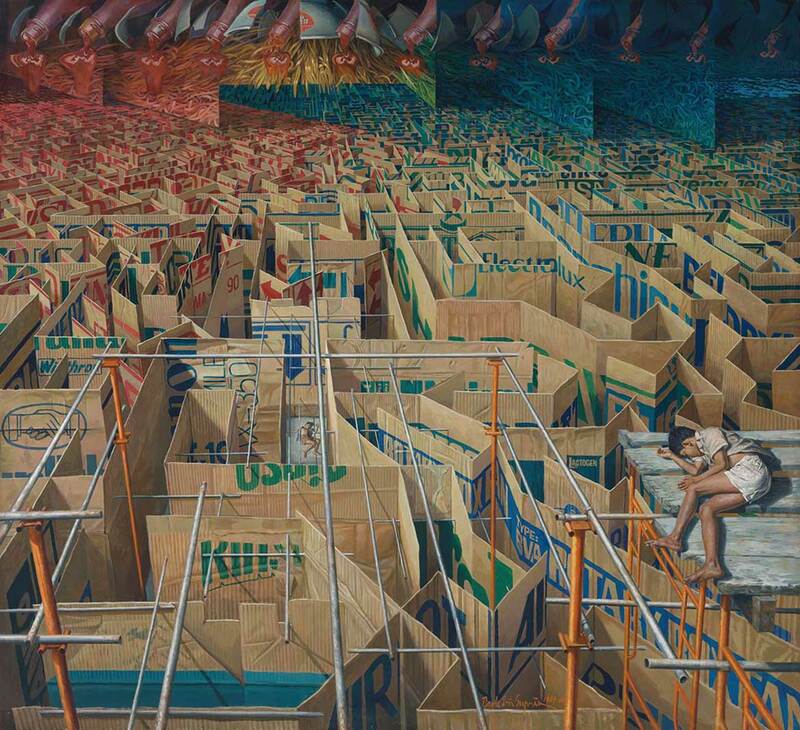 The Imbroglio Tropical Paradise 2018, for example, provides background glimpses of an exoticised landscape, but the scene also includes a white tiger and a peacock (lifted from a taxidermy display at the popular Museum Satwa in East Java); a sleeping figure from Indonesian artist Dede Eri Supria’s painting The Labyrinth 1987–88, exhibited in ‘The 1st Asia Pacific Triennial of Contemporary Art‘ (APT1); protestors from a rally in December 2016, in which thousands marched against Jakarta’s Chinese Christian governor for alleged blasphemy against Islam; and the hanging sculptures of Indonesian–Australian artist Dadang Christanto’s APT1 installation. 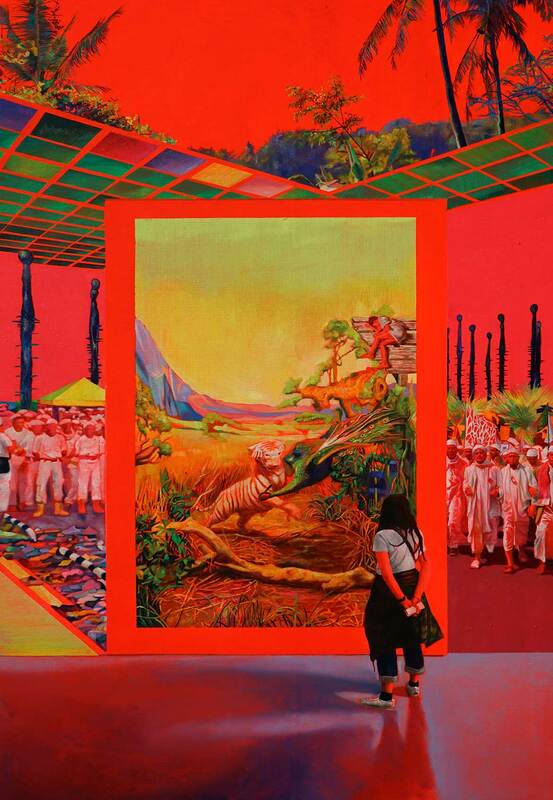 In another of his works for ‘The 9th Asia Pacific Triennial of Contemporary Art’ (APT9), A Biennale and the Orient Painter 2018, Albaiquni draws curious parallels between old and new eras, including likening the traditional pilgrimage to Mecca with the way people flock to international art events such as the Venice Biennale. 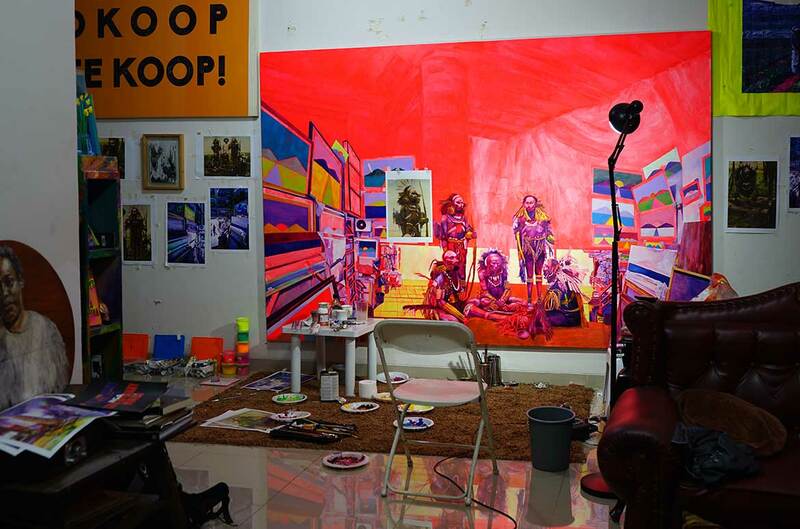 1 Albaiquni includes references in his art to his father, Tisna Sanjaya, as well as other artists of this generation, including Dadang Christanto, Heri Dono, FX Harsono and Arahmaiani. 2 Email from the artist, 21 August 2018. 3 Email from the artist, 21 August 2018. My forest is not your garden 2015–18 is a collaborative installation by Singaporean artists Donna Ong and Robert Zhao Renhui. A critical take on attitudes towards the natural world of the tropics, the installation integrates Ong’s evocative arrangements of artificial flora and tropical exotica – titled From the tropics with love 2016 – with Zhao’s The Nature Museum 2017, an archival display narrating aspects of Singapore’s natural history, both authentic and fabricated. 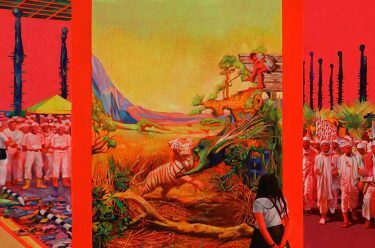 Free, and curated for audiences of all ages, ‘The 9th Asia Pacific Triennial of Contemporary Art’ (APT9) profiles artworks by more than 80 artists, groups and projects from over 30 countries, and is presented across the Queensland Art Gallery and the Gallery of Modern Art until 28 April 2019. Read more about Zico Albaiquni, Donna Ong and Robert Zhao Renhui in The 9th Asia Pacific Triennial of Contemporary Art available online or in store. 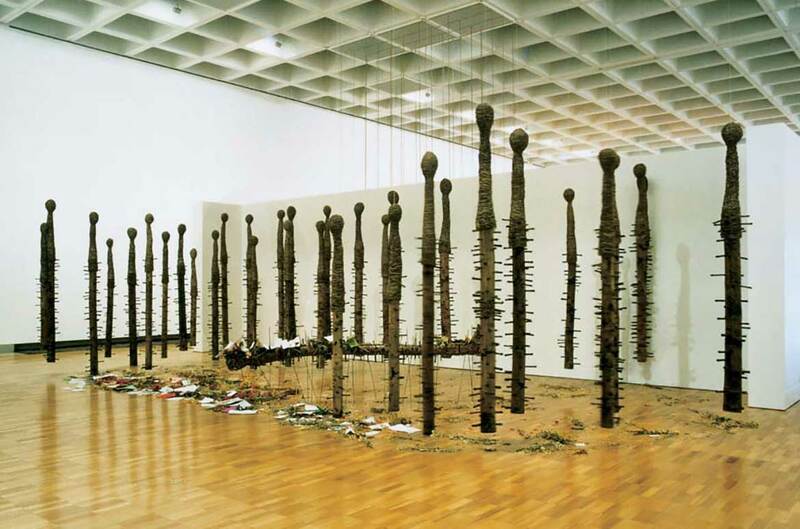 The publication represents an important and lasting document of the current artistic landscape of Asia and the Pacific. QAGOMA respects your privacy and will not share your personal details with third parties without your consent. We will use your information to send email updates including newsletters, special offers and more. You can opt-out at any time. For more information refer to our Privacy & Security Statement.